Amish people can seem a little health-obsessed. At least that’s the impression you get when perusing Amish publications, filled as they often are with advertisements for a wide range of health-enhancing products. Many Amish purchase piles of vitamins and supplements via local dealers and mail order. You can also point to the organic food movement, which has spawned Amish evangelists who believe in the health benefits of their chemical-free products as much as they do their power to earn an extra dollar. Not to mention the prevalence of unorthodox health practices, including home remedies. Regardless of the veracity of the treatments, examples like these put the lie to the idea that the Amish disregard health or rely strictly on God’s providence to assure their well-being. Amish actively try to preserve and enhance their health, even if some of the methods and means are unconventional. Let’s take a look at one category popular among Amish–vitamins and supplements. Should I take them? This is a question that I kick around from time to time, often when reading the latest headlines seemingly proving the effectiveness or futility of a given pill. I used to be something of a vitamin person–or I was at least regular about taking them. Nothing exotic–a multi-vitamin as well as glucosamine and chondroitin for my joints a regular basis. I stopped some years ago. Today I seem to feel okay, and rarely get ill. The knee joints only act up when I crack 8-10 miles on my runs. I try to eat well (though junky food sneaks in more than it should). I exercise regularly, though don’t quite get the sleep I’d like. Would taking vitamins enhance my well-being and assure me greater health? It’s a tough question–one that seems hard to prove either way. Maybe I’ll get a disease decades from now that could have been averted had I been popping this or that pill daily. That is the seductive pull of vitamins and supplements. If it can’t hurt you, and it might help you, then isn’t it wise to be taking as much of this stuff as possible? Or as you can possibly afford? Vitamin and supplements companies rely on this line of thinking. Companies that sell health products on a multi-level-marketing basis have long operated in Amish communities. The tight social networks and emphasis on health have made the Plain market attractive to supplement dealers. Reader responses range from the highly negative–warning against the manipulative sales nature of the health schemes–to those that advise against knee-jerk disdain for the program simply because hard-working sellers are being rewarded for their efforts to help enhance others’ well-being. The Amish example is echoed in the greater public, where the health supplement market has exploded in recent years. I’m finding a range of recent estimates for supplement industry value–most placing it in the tens of billions of dollars. Regardless of the exact figure, a lot of us seem to be convinced the pills and liquids are making us better off. And maybe they are–or at the least, they can’t hurt, right? 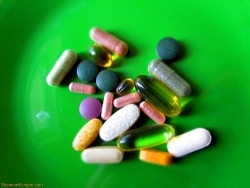 So what do you think–are vitamins and supplements worth it? 28 responses to Are vitamins and supplements worth it? Sure can’t hurt — as with any medications, always let your doctor know exactly what supplements you are taking….some can interfere with your prescription drugs, while some can keep all of your systems in balance. In today’s world, while so many are relying on “fast food” or quick foods, sometimes you are not getting all of the basic food groups and benefits from them. So much of the “fast foods” are processed so much, the nutrients in them are almost non-existent. Of course, it’s up to US, to choose wisely, when eating “on the run”, not someone else’s responsibility. My mother lived to be the “ripe ole age” of 98, and religiously took her multi-vitamin, along with mostly home-cooked foods, and never had to take any form of heart meds/cholesterol lowering meds, etc….always healthy up until when she reached 97, when she did get a form of female cancer, which then progressed beyond radiation, etc….She always swore that her vitamins were keeping her healthy, never sick it seemed, active, alert, cheerful her whole life, with no memory problems. So, I don’t think vitamins and minerals can hurt you or harm you….as with everything, “in moderation” — large doses of certain vitamins can be toxic, or harmful to your system’s balance, but a simple multi-vitamin (even less expensive brand), can’t hurt. As to the pyramid selling process, that is an individual’s call, if they want to use that as a source of income or to promote healthy living to others. You can always say “No thank you”, if you don’t care to take those particular vitamins. I have used supplements when my health was decidedly poor – after cancer surgery, for instance. I think a well-balanced whole foods diet is more important though. Supplements are useful when you need them, such as when you are traveling a lot (looking at you, Erik) and your food choices are limited. They won’t save you from a lifetime of poor eating habits, though. There is no reason for supplements to be as expensive as they are, except for the marketing and layers of mark-up, espeically in these sell-ftom-home businesses. I would think that a midwife has no business selling supplements. She is in a unique position in health care, and people are vulnerable to making hasty or emotional decisions when having a baby. Even if her product is excellent, it is not a time to be selling something that new parents might not be able to afford but feel they should get because the midwife said so. I’d agree on the midwife Magdalena, and on the potential usefulness when you are on the go 🙂 But on this particular midwife, I’m not sure that she is selling them herself, as reading the response it seems you could interpret it both ways. But yes, probably would be a conflict of interest there. I am a big believer in conventional medicine and research (though I do realize even clinical studies can be skewed and influenced by external factors) but I also think our bodies have ways of telling us things as well. I’ve thought about this in regards to Amish, since they don’t believe in health insurance, it seems they do believe in natural vitamins and supplements to prevent, hopefully, sickness & disease. As far as the milti layer marketing way of purchasing-I’d rather help a family making honest living if I am able, and reap the benefits at the same time, but I’ve decided it’s not in me to do this myself. However I know someone who finds great joy in helping his Amish friends this way and they are grateful for the supplement he sells-so, trial & error isn’t harmful if it’s natural. I believed that people who ate a healthy balanced diet didn’t need to take vitamins or supplements. After I got cancer I had blood tests that showed serious deficiencies so now I am taking supplements recommended by my doctors. I still don’t think that it is safe to take megadoses of vitamins unless you know that you need them. As for selling supplements to others, it’s not my cup of tea but their customers can decide for themselves if they wish to buy. I have used supplements from time to time but find I actually feel better over all when I just eat more natural grown foods that are not processed to death. Sometimes that is not always easy to do, especially if you travel a lot. I think we can put too many “man made”, chemical ladden foods and supplements in our bodies so no matter what we choose we need moderation. I am not above “home remedies” for minor ailments and injuries but recognize when something is more serious and needs the attention of a professional. I have a friend who’s doctor told her that she feels sorry for the Amish because ‘they fall for everything.’ This is evidenced in my life by the number of Amish people who have tried to sell my husband and me their MLM health products. I’m sorry but $180 a month is a ridiculous sum of money to be spending on nutritional supplements. For pete’s sake, just eat more veggies. Also my husband’s grandmother finds a new ‘miracle’ vitamin every week that will cure all her ails. I’ll take my multivitamin and be done with it. We all gotta die anyway. Rachel: “We all gotta die anyway”…quote of the day for me 😉 Sorry that just gave me a chuckle here. Comment on "Are Vitamins and Supplements Worth It?" I agree with several comments here that the taking of some supplements at different times in your life can be very beneficial. I don’t like pyramid scheme operations because the very organization of that structure forces the seller to look at every person in their life as their next sale or “mark”, if you will. That kind of filter on your everyday relations with people dissolves trust and destroys relationships, I have found. I didn’t realize that some of the Amish were being folded into the “vitamin-pyramid-structure” crowd. Personally, I take one supplement and try to eat a lot of veggies and fruit! Kim I have bought from an Amish friend on a couple of occasions. He was friendly about it and I felt comfortable that I could say no and he’d still be nice to me 🙂 I think the demeanor you have as you go about it is pretty important. To generalize for a second Amish character tendencies may lead to softer selling in general. That said yes I think people can get sucked in to looking at everyone in their life as the next sale. I only take one vitamin. I know some who have used herbs and other vitamins excessively and have died because of it. I do not believe in taking lots of vitamins and herbs. I do take vitamin D due to a defeciency but otherwise just eat healthy. I have no other health concerns and doing great! With exercise everyday and eating right, I have kept my arthritis in check and Im hardly ever ill. Just a cold now and then or allergy problems, so I feel Im doing the right thing. Do not believe in people trying to force a sale on you for all those liquid drinks and vitamins. Have had enough people try to force those on me and I always refuse the sale. I dont knmow about the capsels but for herbs that are grounded in powder when dried,and liquid tonics i beleave so.I am going to try to help mend 3 cavities and my nerves with passion flower tea. I was at a wife’s relatives place where they were going through boxes of supplements and extracts someone had given them. They thought they had hit a bonanza. The proof of the pudding is that in general people who use common sense in eating habits are just as healthy as those who take all the supplements and vitamins. Not saying that on occasion a boost in a certain mineral or vitamin might be useful or even needful. But we dont need to get uptight if we happen to eat a Big Mac on occasion, and then think we need to pop some pills to make up for the lack of vitamins that the Big Mac had. My conclusion is that worrying about the exact amount of vitamins and minerals of all the foods is probably more harmful to our health than what a slightly unbalanced diet may be. Stress is hard on a person … so dont stress ourselves with counting milligrams of Vitamin B13 or whatever. mcdonalds is ok on their apple pies 2 for 1.00. I believe that a well-balanced diet outplays vitamin supplements 99% of the time. There are times when extra vitamins might be necessary. Folic acid when you plan to get pregnant and in early pregnancy, vitamin D for people living near or in the Artic (like me) and of course any time you are deficient of a vitamin. On the whole though I believe that food is more than the sum of its parts and taking apart the nutrients and vitamins can never be the same as eating food that contains all of that from the start. It is often the case when researchers see that ‘people who eat tomatoes are less likely to get X disease’ and then they try to explain it with ‘tomatoes contain y’ but often we do not see the same result when someone is given supplement of y. In fact the explanation might be that ‘tomatoes contain y, q, z, a and b in prefect propotions to avoid disease X’. I take vitamin D in winter and occationally I take a multivitamin but never on a regular basis. I know that at least that my iron levels are good, I am not even allowed to take iron supplements for now which most pregnant women need because my levels are so high. It is my opinion that if the soil were as pure and healthy as it once was, hundreds of years ago, before it was depleted and contaminated the way it is today,one could definitely get the nutrition they needed from their diet. Today one would need to eat a wheel barrow full of fresh produce,three times a day, to get the nutrition they need, but then they take the risk of ingesting mega amounts of other undesirable elements.I do not take any specific supplement on a regular basis, but I do believe one benefits from the use of certain supplements during various times of need.But then there is the problem of finding a reputable vitamin company whom you trust. One that is not “in any one’s pocket” for whatever reason.That is a feat in itself. When I find a supplement that works for me, I will gladly recommend it to others, but then no 2 bodies react the same to the same supplement. I think we are each,on our own to experiment with and do the research to find what works best for us. Medical people do not agree to the world using supplements,because there is not that much money in it for them. I agree with some earlier comments that a well balanced diet is the best thing. I do not take any supplements, though I did take iron pills a long time when so advised by a doctor. “Can’t hurt” is not exactly accurate. Some supplements can be harmful. For any kind of health information I like to rely on the scientific approach. For example, I read the U.C. Berkeley Wellness letter (you can sign up for free email editions. As for home remedies, some of those have been researched and found to be safe and effective. Just because something does not come from a pharmacy, that does not make it “snake oil”. A significant percentage (maybe 25%)of our pharmaceutical remedies are either made from plant extracts or are artificially made plant chemicals – aspirin being perhaps the most widely used. Many herbal remedies have been validated by scientific research. Not a doctor or magician, BUT they work for me! I was a sickly, anemic child, but ate a lot of vegetables and did not like meat (my mom would often grid up liver with hamburger to boost my iron, but I KNEW it…pretty easy when she’d also cook liver for the dog!). I had rheumatic fever, pneumonia, whooping cough (all by age 4), then recurring tonsilitis, among the usual colds, flu, measles (didn’t have chicken pox ’til adulthood, after my kids caught it, and mine was far worse than theirs—even in my mouth). Before I had my tonsils out at age 6 (after missing an entire month of school due to tonsilitis), I had to take a liquid iron supplement for a month. Once my tonsils were out (they had become a source of infection themselves, and the same happened to my own kids), Mom had me take vitamins daily. As I got older and did research, I added more vitamins/minerals—fish oil, calcium, Co-Q 10 (because I’m on cholesterol med that depletes that enzyme), extra D (especially in winter, for the “blues” like you, Erik), potassium. I’m Diabetic and that takes a toll on a body, but I rarely get sick—a cold or two in a year, and most years none. I’m sure the vitamins have helped because I’ve taken them regularly, and my doctors know about them. I used to take glucosamine/chondroitin, but after a knee replacement followed by spinal surgery a few months later, it was suggested (doctor) that it was most likely not doing anything but depleting my money. I weaned myself off of it. So far, so good. I know about fat soluble vs water soluble vitamins. I consult the Nat’l Institutes of Health, Mayo Clinic, American Diabetes Assoc., etc., for information, as well as books (I work in a library, after all!) & journals. I took a medical reference class (for work) and don’t believe the “tall tales” I hear about “miracle” drugs, weight loss plans, etc. My meds are mostly bought from a reputable company that’s been around for decades (and they’re not overpriced, either). I know I’ve gotta die someday, but I’m pretty sure staying on my regimine (& always re-evaluating) I’ll be around a while longer than without them…unless I get hit by a truck or a meteor lands on my head! …I don’t know how I posted twice. Sorry! Just ignore that second posting! I get concerned when healthy, well-nourished people take vitamin supplements. It is relatively unusual for Americans to be deficient in anything, unless they opt for a really sorry diet. According to our prayer list at church, cancer is rampant in the U.S. I know that carcinogens are a major factor, but somewhere in the back of my mind I sense that cancer cells are feeding on something. What might that be? Possibly all those excessive vitamins and minerals. Just a thought. While we’re (sort of) on the subject, why are so many adults and children having to take Zyrtec/Singulair/Claritin every day? Why are we allergic to our surroundings? There are marked increases in eczema, asthma, and auto-immune diseases…diseases that burst forth from the inside out. We’re getting far too much of something. I really believe the best thing we can do is cut the preservatives out of our diet. I really do think they build up inside our gi tract preventing vitamin and mineral absorption. I’m 71 and diabetic. I take a multiple vitamin each day, a garlic pill (which my doctor suggested because I have gastroparesis–failure to digest properly) and it has seemed to work. A couple of times a week I take a Vitamin D supplement because I only go out about once a week. I have severe arthritis in my knees (age and an accident many years ago combined) and take 2 Aleve a day for that. Whenever I can I eat food that doesn’t have preservatives. The main supermarkets here have organically (no preservatives) grown departments which I visit frequently. Lattice had an important commment. I take Allegra daily because of allergies. In 12 years as a librarian in a local elementary school before my retirement, I saw dozens of children with horrible allergies. Many were allergic to newly installed rugs because of the chemicals in the rug materials!! No wonder we are all having problems with allergies. Look at all the “crude stuff” pumped into the air by industry, cars, and so on. How many of you read in newspapers recently about the “pink slime” added to ground beef for flavoring and whatever? The Arizona Daily Star here in Tucson did several articles on it. Apparently it is not inherently bad but!!! Two of the grocery chains here have now eliminated it. I’m old enough to remember having studied in history and social studies about the terrific battle to bring purity to canned goods, meats and so on in the period from about 1880 to 1920. Same thing with all the newspaper ads of the period for all the supplements supposed to bring health. Now I look at my local paper and see the same things. Seems as tho we never change!! It concerns me when I see all the vitamin supplements and cure alls advertised. I’ve also several friends who got sucked into multi level marketing “opportunities” which fortunately they realized not too much later were simply scams. I agree with Kim in NY – multi level marketing can really destroy relationships when someone gets gung-ho into it. And isn’t it curious that the products sold by mlm are always pills and supplements high on promises and markups? Legitimate products are never sold in that manner. The “placebo effect” explains why a drug or vitamin might appear to be doing some good even though it is not. I choose to eat healthy, and get my medical advice from an actual doctor — not a vitamin salesperson. Nothing wrong with the proper supplements in proper dosages, when necessary. Not everybody needs everything everyday. Genetics plays a a part in it too. Well balanced diet with minimal processing and preservatives is the way to go. I am not a fan of multi-level marketing. I want to enjoy people for who they are, not what they want to sell me. I have cut several relationships short because I was perceived as a “potential client”. No thank you. Leave a reply to Are vitamins and supplements worth it? Should Amish horses wear reflectors?